How far have Netflix’s (s NFLX) opinion ratings fallen with the general public? In the few weeks since it announced a change in its pricing structure that could lead some users to pay as much as 60 percent more, its favorability with consumers has fallen dramatically, putting it roughly in line with Blockbuster (s DISH). But even though Netflix subscribers continue to be unhappy with the way the company handled the change, they’re still unlikely to quit the service altogether. 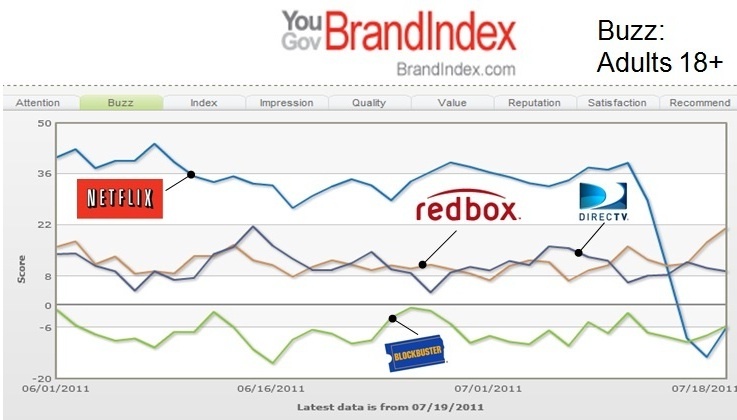 According to YouGov BrandIndex, which measures the consumer sentiment of various brands through daily surveys, Netflix has fallen from top of the pack among video services to among the bottom. The polling firm’s BrandIndex Buzz score ranges from 100 to -100, based on how favorably consumers respond to surveys about the brand. Meanwhile, Morgan Stanley has surveyed Netflix subscribers to see how the price change will effect their plans to use the service in the future. And the results of those surveys aren’t entirely encouraging. The firm reports that about half of those surveyed (49.5 percent) fell into bucket of users that belong to the $9.99 unlimited streaming and one-DVD out plan, which will be most affected by the pricing change. Those users will either be forced to downgrade to a $7.99 streaming only or one-DVD plan, or pay $15.98 for both. So which will they choose? Survey results indicate that about 15.5 percent of those users will migrate to the higher-priced hybrid plan, while 31.7 percent will go streaming-only and 13.2 percent will go DVD-only. But more than a quarter of users — 26.4 percent — said they would cancel their subscription altogether. According to Morgan Stanley, that would imply a 22 percent decrease in domestic subscription revenue and a 2 percent decrease in domestic average revenue per user. But Morgan Stanley thinks the survey overstates the number of people that will actually unsubscribe from the service. In fact, the company concludes that the suggested subscriber churn of 25 percent across all hybrid plans was too high, and due to emotional response when taking the survey, which was taken a few days after the price increase was announced. Since then, Morgan Stanley notes that ad hoc polls have shown consistently lower churn results as users process the news. Actually, I don’t mind saving a few bucks a month for streaming video only. I think Netflix will feel it more than we do, Thanks for the price drop! The way the price increase was handled seemed to me to be a PR misstep. The cost of the loss of brand loyalty is difficult to calculate so soon, but these numbers are interesting. If Netflix could have been more transparent about how the money would be used to increase the variety and quality of the streaming service, I think there’d have been less backlash. It’s hard to feel OK about paying twice as much next month for exactly what I had last month. Netflix gained its edged from DVDs. That’s where it achieved success. When it comes to streaming, really, they don’t have anything unique. This rate hike’s ridiculous. I had absolutely no hesitation/trouble canceling my subscription with Netflix, a subscription I had for for about six years. All Netflix has done is open the door for its competition. The problem for some of us is that we’ve given up on other entertainment solutions (due to price) and chose Netflix. Until there’s another solution that offers streaming media as well as current movies (digital or on disc) we have to stick with Netflix. I am part of the not sure. However, no one has mention the option of suspension to account up to 90 days, which I did, to see what Netflix does. In other words, Netflix cannot charge me for almost 3 months. At that time I can cancel my account, or switch plans. Money speaks louder then words.